To be able to skip and remove elements from various data structures. R has many powerful subset operators. Mastering them will allow you to easily perform complex operations on any kind of dataset. There are six different ways we can subset any kind of object, and three different subsetting operators for the different data structures. Let’s start with the workhorse of R: a simple numeric vector. In R, simple vectors containing character strings, numbers, or logical values are called atomic vectors because they can’t be further simplified. So now that we’ve created a dummy vector to play with, how do we get at its contents? It may look different, but the square brackets operator is a function. For vectors (and matrices), it means “get me the nth element”. the : operator creates a sequence of numbers from the left element to the right. This is a vector of length one containing an NA, whose name is also NA. In many programming languages (C and Python, for example), the first element of a vector has an index of 0. In R, the first element is 1. But remember the order of operations. : is really a function. It takes its first argument as -1, and its second as 3, so generates the sequence of numbers: c(-1, 0, 1, 2, 3). After you find 2 different commands, compare notes with your neighbour. Did you have different strategies? This is usually a much more reliable way to subset objects: the position of various elements can often change when chaining together subsetting operations, but the names will always remain the same! Since comparison operators (e.g. >, <, ==) evaluate to logical vectors, we can also use them to succinctly subset vectors: the following statement gives the same result as the previous one. Breaking it down, this statement first evaluates x>7, generating a logical vector c(FALSE, FALSE, TRUE, FALSE, TRUE), and then selects the elements of x corresponding to the TRUE values. &, the “logical AND” operator: returns TRUE if both the left and right are TRUE. 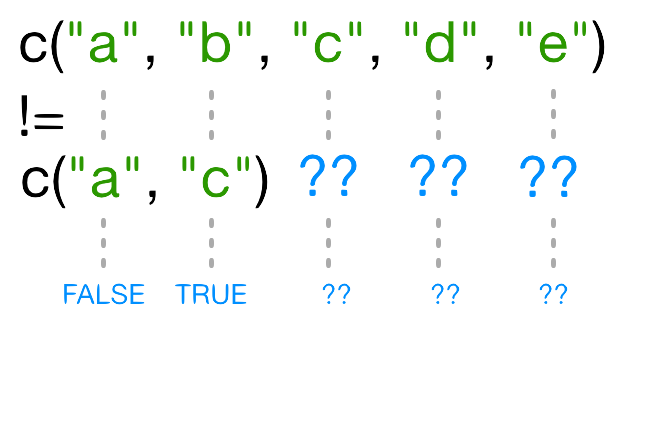 |, the “logical OR” operator: returns TRUE, if either the left or right (or both) are TRUE. You may sometimes see && and || instead of & and |. These two-character operators only look at the first element of each vector and ignore the remaining elements. In general you should not use the two-character operators in data analysis; save them for programming, i.e. deciding whether to execute a statement. 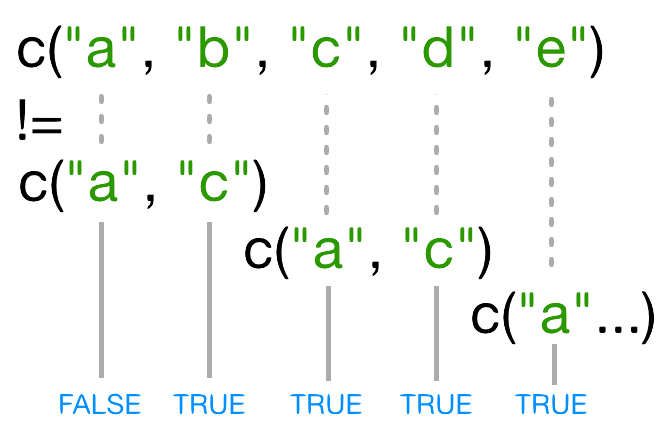 !, the “logical NOT” operator: converts TRUE to FALSE and FALSE to TRUE. It can negate a single logical condition (eg !TRUE becomes FALSE), or a whole vector of conditions(eg !c(TRUE, FALSE) becomes c(FALSE, TRUE)). Additionally, you can compare the elements within a single vector using the all function (which returns TRUE if every element of the vector is TRUE) and the any function (which returns TRUE if one or more elements of the vector are TRUE). Write a subsetting command to return the values in x that are greater than 4 and less than 7. Remember you can search for help on operators by wrapping them in quotes: help("%in%") or ?"%in%". R did something, but it gave us a warning that we ought to pay attention to - and it apparently gave us the wrong answer (the "c" element is still included in the vector)! So what does != actually do in this case? That’s an excellent question. Why does R give TRUE as the third element of this vector, when names(x) != "c" is obviously false? When you use !=, R tries to compare each element of the left argument with the corresponding element of its right argument. What happens when you compare vectors of different lengths? In this case R repeats c("a", "c") as many times as necessary to match names(x), i.e. we get c("a","c","a","c","a"). Since the recycled "a" doesn’t match the third element of names(x), the value of != is TRUE. Because in this case the longer vector length (5) isn’t a multiple of the shorter vector length (2), R printed a warning message. If we had been unlucky and names(x) had contained six elements, R would silently have done the wrong thing (i.e., not what we intended it to do). This recycling rule can can introduce hard-to-find and subtle bugs! Selecting elements of a vector that match any of a list of components is a very common data analysis task. For example, the gapminder data set contains country and continent variables, but no information between these two scales. Suppose we want to pull out information from southeast Asia: how do we set up an operation to produce a logical vector that is TRUE for all of the countries in southeast Asia and FALSE otherwise? There’s a wrong way (using only ==), which will give you a warning; a clunky way (using the logical operators == and |); and an elegant way (using %in%). See whether you can come up with all three and explain how they (don’t) work. The wrong way to do this problem is countries==seAsia. This gives a warning ("In countries == seAsia : longer object length is not a multiple of shorter object length") and the wrong answer (a vector of all FALSE values), because none of the recycled values of seAsia happen to line up correctly with matching values in country. (or countries==seAsia | countries==seAsia | ...). This gives the correct values, but hopefully you can see how awkward it is (what if we wanted to select countries from a much longer list?). The best way to do this problem is countries %in% seAsia, which is both correct and easy to type (and read). At some point you will encounter functions in R that cannot handle missing, infinite, or undefined data. likewise, is.nan, and is.infinite will do the same for NaN and Inf. is.finite will return all positions in a vector, matrix, or data.frame that do not contain NA, NaN or Inf. Now that we’ve explored the different ways to subset vectors, how do we subset the other data structures? Factor subsetting works the same way as vector subsetting. when dealing with multi-dimensional arrays, each argument to [ corresponds to a dimension. For example, a 3D array, the first three arguments correspond to the rows, columns, and depth dimension. Matrices can also be subsetted using their rownames and column names instead of their row and column indices. Which of the following commands will extract the values 11 and 14? Now we’ll introduce some new subsetting operators. There are three functions used to subset lists. We’ve already seen these when learning about atomic vectors and matrices: [, [[, and $. Using [ will always return a list. If you want to subset a list, but not extract an element, then you will likely use [. This returns a list with one element. We can subset elements of a list exactly the same way as atomic vectors using [. Comparison operations however won’t work as they’re not recursive, they will try to condition on the data structures in each element of the list, not the individual elements within those data structures. To extract individual elements of a list, you need to use the double-square bracket function: [[. Notice that now the result is a vector, not a list. Using your knowledge of both list and vector subsetting, extract the number 2 from xlist. Hint: the number 2 is contained within the “b” item in the list. But for a single column the result will be a vector (this can be changed with the third argument, drop = FALSE). Extract the first row, and the fourth and fifth columns (continent and lifeExp). Why does gapminder[1:20] return an error? How does it differ from gapminder[1:20, ]? Create a new data.frame called gapminder_small that only contains rows 1 through 9 and 19 through 23. You can do this in one or two steps. gapminder is a data.frame so needs to be subsetted on two dimensions. gapminder[1:20, ] subsets the data to give the first 20 rows and all columns.